Design minimizes spillage and air inclusion. Push-to-connect design enables quick, simple operation. No twisting, turning, or wrenching necessary. Wide variety of configurations, end connections, and stem and body connectors. 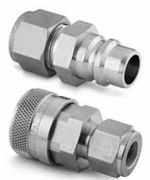 Available in single-end shutoff and double-end shutoff models. QC series instrumentation quick-connects are used in sampling systems and test and calibration equipment requiring frequent connection, minimal air inclusion, and minimal spillage.